Last Saturday president Koroma visited the south of the country to see firsthand, the efforts being made by the districts’ medical teams and local people, in fighting Ebola. But back in the capital Freetown, all was not well. The main topic for discussion on the popular radio talk show – Monologue was about ‘the performance of the president in office’. 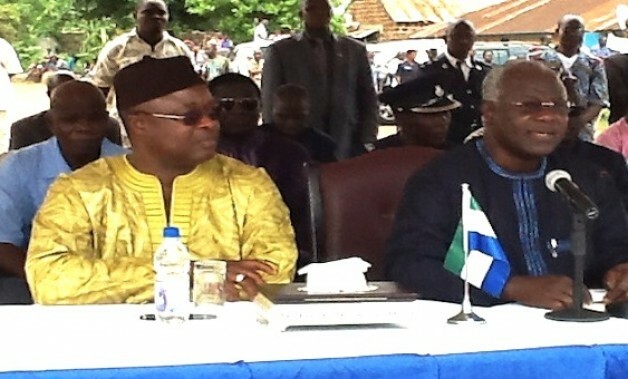 President Koroma was less than impressed. Upon returning to Freetown, he immediately evoked sections 29(5) & 29(6a) of the country’s Constitution, which confers absolute power on the president to order the detention of anyone he believes is threatening the peace and stability of the country. The president wasted no time in signing an executive order, which led to the arrest yesterday, Tuesday, of David Tam Baryoh (Photo: Above), who is tonight spending a second night at the notorious Pademba Road prison. 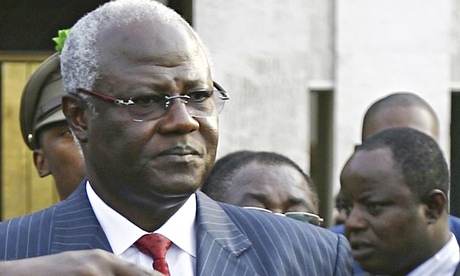 Is this president Koroma’s newly avowed military style approach to tackling Ebola? Monologue host – David Tam Baryoh – a controversial journalist who has long been branded by the Koroma government as enemy of state, is no stranger to Pademba Road or the capital’s criminal investigations department (CID). Once a strong supporter of the president, Tam fell out of favour with State House, after his fellow tribesman and close friend – vice president Sam Sumana was unofficially declared irrelevant and redundant by Koroma. (Photo: Sam left – Koroma right – no love-lost). Since then, David Tam Baryoh has been subjected to various forms of police harassment and intimidation, based on executive orders from above. It is understood that Tam was arrested yesterday, after criticising the president’s handling of the Ebola crisis, as well as his intention to revoke the country’s Constitution so as to guarantee his third term tenure in office in 2018. But tonight there are concerns about Tam’s state of health in prison, where he is locked up without charge. Human rights groups are calling for his immediate release. Moses A. Kargbo – National Secretary General of the country’s Association of Journalists (SLAJ), has issued a statement saying that; “SLAJ is deeply worried about the health condition of David Tam-Baryoh, who is presently detained at the Pademba Road prison on an “Executive Detention Warrant” signed by the President. “David Tam-Baryoh is a hypertensive patient whose blood pressure had risen to a level described by senior physician specialist, Dr. James Russell – who examined him in detention at the Criminal Investigation Department (CID) on Tuesday morning – as a “hypertensive emergency”. “The medical doctor further advised that he be hospitalized to “avoid a hypertensive crisis”. In this regard, SLAJ is concerned that the Pademba Road prison does not have the medical facility to deal with his condition. Although reaction to the arrest of the journalist has been mixed, many Sierra Leoneans believe that this is another example of the government’s poor human rights and civil liberty credentials. 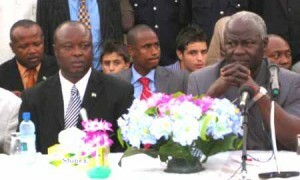 (Photo: Koroma). Our President Ernest Bai Koroma has proven that he does not respect free speech, as evidenced by the arrest and detention order of David Tam Bayoh, following the airing of his monologue program on Saturday. If I remember correctly, this is not the first time Tam Baryoh has been whisked to prison for criticizing the government of President Koroma for its many failures. It begs the question why the President is turning on those who played a pivotal role in getting him into State House in 2007 and 2012. Even before the dust settled on the resignation or firing of Executive Assistant Sylvia Olayinka Blyden, depending on which side you believe, we are confronted with the fall from grace of yet another of the president’s trumpeters. We all remember the role Awareness Times and the Monologue Programme played in annihilating the hopes and aspirations of the flag bearer of the opposition SLPP and party members. The Monologue Program was the staging ground for ridiculing and embarrassing the opposition. Mr. Bayoh developed a knack for crying down anyone not seen as supporting the APC party in their bid to reclaim State House in 2012. During the 2012 election campaign, Tam Baryoh and Sylvia Olayinka Blyden were all over each other, competing strenuously in casting aspersions on the opposition SLPP party, so as to attract the attention of the President. In the end, Sylvia Olayinka Blyden was handsomely rewarded, whilst Tam Baryoh was left wondering whether he was drowned out by the voice of his nemesis. Notwithstanding this, Tam continued to support the APC party. After all, all was not lost, as he succeeded in getting his Uncle Sam Sumana back into office as vice president. The marriage between these two media houses and the government, lost its maiden appeal, when it became apparent that the APC party had developed a strong disdain and suspicion for anyone who is not a northerner. Tam Baryor is not. He is Kono. For Tam Baryoh, it was the poor treatment of his uncle the vice president, who had spent considerable amount of his money in helping the APC party win the 2007 and 2012 elections that became the turning point. This and the realization that he was used as a pawn by president Koroma, may have emboldened the poor Tam to speak out. Frankly, though I sympathize with the plight of Tam Baryoh because of the breach of his constitutional right to free speech, I am not going to lament over his current predicament. What these so called “journalists” need to understand is that if you want to make a name for yourself, and remain credible, you should be seen as someone who does not openly take sides, especially with the government. Because, when your services are no longer needed you are discarded like yesterday’s news. We, the people of Sierra Leone, together with the fourth estate should endeavour to rise above party politics and work hard to create a country that has stable political parties, and help build transparent mechanisms for change of leadership. If we continue to sell our votes to the highest bidder – irrespective of their fitness to assume the highest office in the land, we will continue to wallow in our own filth, as the Ebola crisis has disastrously proven. The Ernest Bai Koroma administration has shown us the error of our ways. And it won’t be soon enough to see them voted out of office. 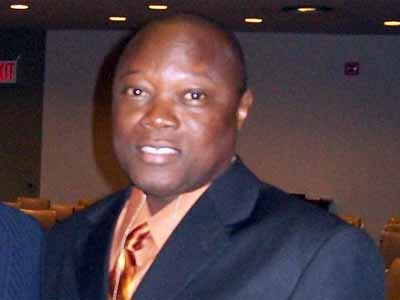 In the dynamics of power politics in Sierra Leone, David Tam Baryoh is a small fry. He may be a journalist, but he is naive and has forgotten what he was taught in school, about the tale of the fighting elephants. With the huge natural resources Sierra Leone is endowed with; currently, off-shore oil exploration is going on, the country is on the threshold of economic ascendancy and the powers that be will not be shy of lining-up their pockets. Mischievous journalists or any form of dissent, with the potential of upsetting the apple-cart or derailing the gravy train, will not be tolerated. The financial stakes are high. And Tam Baryoh should also learn that in politics – whether national or international – what is permanent and constant is INTEREST, and that friendship and acquaintanceship are only for the moment.